Scott Steinberg is a best-selling expert on leadership and innovation and has been seen by over 1 billion people worldwide. 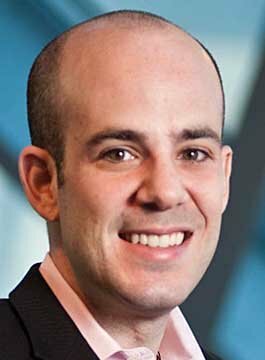 Described by the BBC as ‘One of America’s top futurists‘, Scott is the author of Make Change Work For You, Millennial Marketing, and Becoming Essential. Steinberg is President of BIZDEV: The Association for Business Development and Strategic Partnerships™. He is also head of FutureProof Strategies, a management consulting and market research firm. Scott helps organisations of every size create competitive advantage and drive change, innovation and growth. Furthermore, Scott has consulted on many industry-leading products and services. Steinberg is recognised as one of the world’s 150 most influential keynote speakers and futurists. As a result, he has featured in over 600 outlets ranging from TIME through to Rolling Stone. His motivational speeches and master-classes show executives how to lead in times of change – and become indispensable. From EMC and eBay to Intel and MTV, he’s worked with many top brands to drive success. As a management consultant and expert witness, Scott advises corporate leaders, attorneys, venture capitalists and investors. He also offers sales, marketing and media training services, and hosts many executive summits. Recent works include Parenting High-Tech Kids and The Modern Parent’s Guide to Facebook and Social Networks. Leading With Innovation: How to Future-Proof Yourself, Fearlessly Innovate, and Success in the New Normal. Even the most successful organisations must continually reinvent their products, processes and enterprises to remain market leaders in an age of growing change, connectivity and globalisation. Audiences will learn how to thrive in the new operating reality, create competitive advantage, and successfully leverage new leadership strategies to adapt to changing times. From more powerful ways to unleash innovation to solutions for capitalising on cutting-edge advancements, discover how your organisation can flourish in tomorrow’s world – effectively applying its most crucial success strategies and skills in context. Finding the courage to embrace change and take chances is the only way to succeed – and stay ahead of the curve. Empower individuals and teams to effectively embrace paradigm shifts, improve organisational learning, and boost productivity with these proven new approaches to leadership, technology and time management. Scott explains how the market’s most innovative firms are embracing change management, best practices and leadership pillars you can implement to breed a culture in which innovation thrives. Technology has become smarter, more affordable and accessible to implement than ever before, putting powerful tools at business fingertips. But how do you maintain a competitive advantage when competitors have access to the same tools? Discover how market innovators continue to leverage technology to stay ahead of the curve, and subsequently ahead of the competition. Attendees will also learn how the formula for surviving and thriving in demanding markets isn’t as complicated as it seems. As a result, they will discover what it takes to keep themselves at the head of the pack continually. The Internet has changed everything for modern marketing, advertising and PR. With connected audiences’ attention fractured across blogs, websites, social networks and more, suddenly, it’s not just about reaching end-users – it’s about creating compelling content they’ll actively seek out and share. Via case studies and real-world examples, discover content strategy solutions which any business can use to connect better and communicate. Subsequently transforming the size, shape and volume of conversations overnight. Technology, business and social change continues at lightning speed, as entire industries and trends emerge and evolve in their wake. Scott illustrates how to implement strategic planning, business intelligence and decision-making frameworks that allow organisations to identify emerging opportunities, and respond before rivals can react. Using techniques pioneered by TechSavvy Global, whose futurists have helped today’s biggest brands anticipate and react to evolving market trends, attendees will learn how to plan and capitalise on new opportunities for the purpose of accelerated business growth.